This wedding cake was created with pound cake (of course!) and layers of mascarpone cream and strawberries. I think it might be my new favorite spring or summer wedding cake. Imagine how perfect this cake would be at your late spring or early summer wedding – especially if you just happen to be planning an outdoor reception! This is a “naked” wedding cake trend I would definitely like to see at a summer wedding! 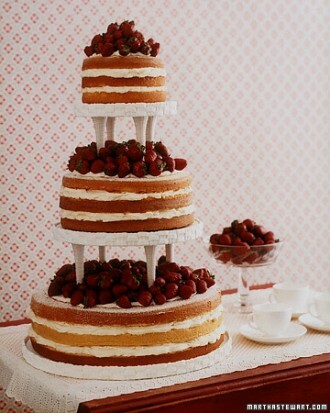 You can find this strawberry wedding cake here.